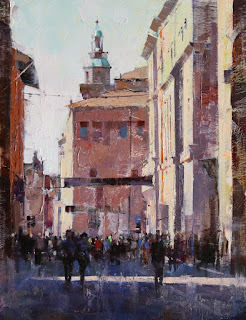 qiang-huang, a daily painter: "T-Day in Bologna"
This one is my studio work based on a photo I took at Bologna Italy. T-days are weekends and holidays for the people in Bologna. They block all the motor vehicles and turn the center of the city into a pedestrian only area. People enjoy T-days with music and wine. This painting was a challenge to me. Italian buildings have so much ornate exterior decorations, and the street were packed with people. I want to just suggest the T-day atmosphere instead of render tightly the details. I have spent about 3 days on this one. I still see quite a few places on the painting I don't feel absolutely satisfied, but I know I must stop. Otherwise the painting will lost its freshness and look too much labored. 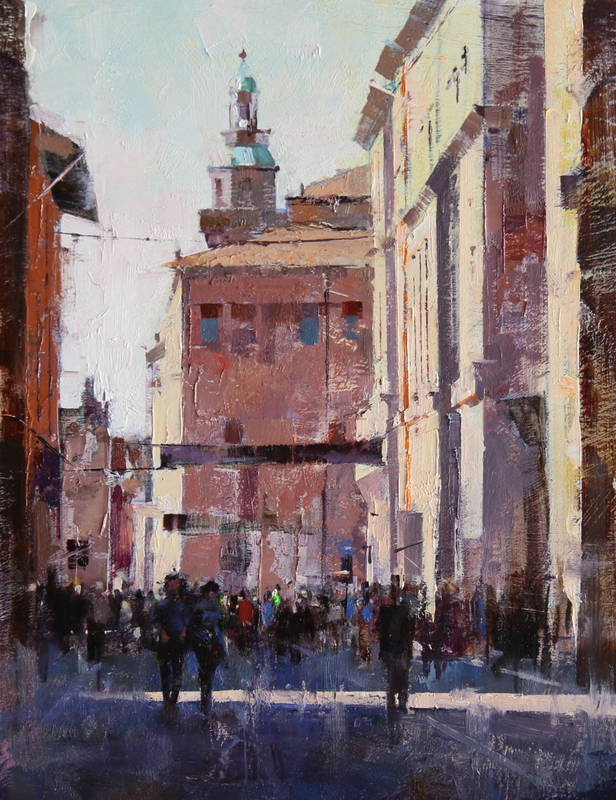 From a distance this painting looks an original view of a street and I must say you have successfully conveyed the sense of t day in Bologna with your colors.